The first Behind Closed doors was one of our biggest and most popular hunts and we are pleased to be bringing it back this year for an encore. The theme this year is Forbidden Desires. 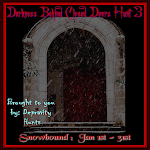 This is one of the darkest hunts in SL so please keep that in mind when applying. Almost anything related to what happens behind closed doors or forbidden desires will be accepted except the following: Absolutely no pedophilia, absolutely nothing else involving children or child avis. These are the merchants that have signed on board to bring you one of the darkest, sexiest hunts in SL. I like to keep my partners under my heel. Please see the hintgiver at the store. By the horns that shed light,the door to the prize hides. Where the seamstress works her trade,the door holds the prize. Multiple gifts at this location. Hint for the first item: Find the girl with the dragon tattoo. For the rest, please see the hintgiver at the store. My Door only opens for Newbies!" This Product Is Proudly Represented by Ladies of the USA! You'll Find Me In The Ruins. Oh, You Silly Cat! You Don't Fit Through that Door! Like shooting fish in a _______. I need to be formal!! Lose it all behind closed doors as the feeling of luscious SILKS gives way to the feeling of the SILKy skin bared just for you.